Care has been taken to provide equal opportunity to all students across the country in view of different School Boards at 10+2 (Class - XII) Level. The question paper shall be based on JEE main 2019 Syllabus. For the purpose of consideration for award of the Vel Tech Mahatma Gandhi National Merit Scholarship, the State from which the candidate has studied and appeared for the qualifying exam (12th standard exam of the State or Central Board) will be taken as the State to which the candidate belongs, even though the nativity of the candidate may be another State or Union Territory. Candidates who have not completed 25 year of age as on 1st July of the year in which admission is sought are eligible. However, in case of SC/ST and PC candidates, age limit shall be relaxed by 5 years. Date of birth as recorded in the Secondary Education Board/University certificate only will be taken as authentic. Candidates who have passed Biology, Physics & Chemistry as compulsory papers are eligible for admission to B.Tech Biotechnology and B.Tech Biomedical. Duration of Exam is 3 hours (180 minutes), The question paper consists of 90 questions. 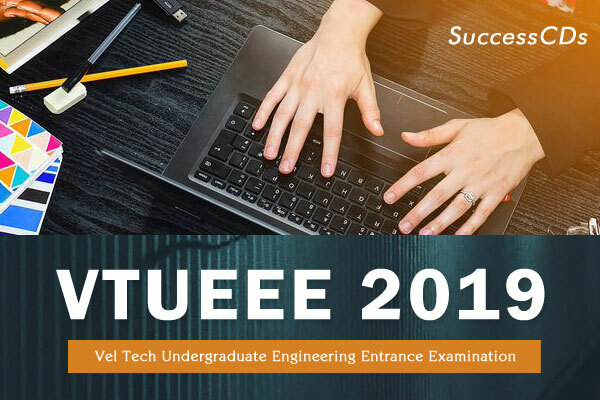 The VTUEEE 2019 Question Paper is expected to consist of 90 questions. The maximum marks are 360. There are three parts in the question paper A, B, C consisting of Physics, Chemistry and Mathematics having 30 questions in each part of equal weightage. Each question is allotted 4(four) marks for correct response. 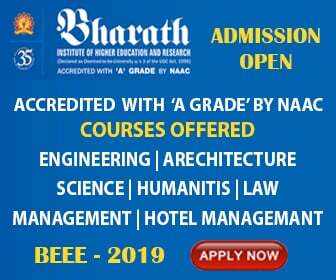 Only those who have appeared for VTUEEE 2019 Exam and admitted to any of the B.Tech Programs are eligible for Mahatma Gandhi National Merit Scholarship. The test results will be available in the website www.veltech.edu.in for Phase-I on 15th February 2019 or as per the notification. For Phase-II on 05th May 2019 or as per the notification. There are more than 300 Scholarships and grants available for the Institutions students ranging from four year 100% Scholarships on tuition, boarding and lodging to 10% Concession in tuition fee. For details see Appendix IV. Exam Fee applicable for all the subjects of each semester for the first attempt only. The exam fee for arrears and improvement are to be paid separately. Based on the rank obtained in VTUEEE 2019, candidates will get concession in the form of Mahatma Gandhi National Merit Scholarship. Candidates can avail the Scholarship calculated based on MPC Aggregate/VTUEEE 2019 ranking whichever is higher. VTUEEE 2019 - How to Apply?